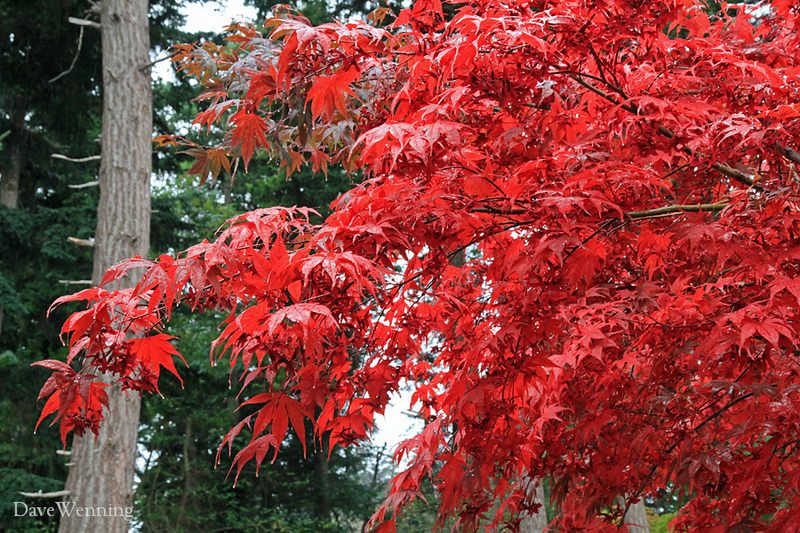 The Japanese Maple, Acer Palmatum, is a Pacific Northwest garden favorite. Our climate, Asian heritage and design aesthetic make it a natural choice. In summer, the leaves of 'Osakazuki' are a rich green. In the fall, they put on a spectacular crimson show during late October and early November. The Sunset Western Garden Book describes them as the variety "with the best fall color." The brilliant red in the photos has been given a bit of shine by a rain shower. I have not exaggerated the red color through editing. In fact, it was necessary to tone down the red saturation a bit in these images. 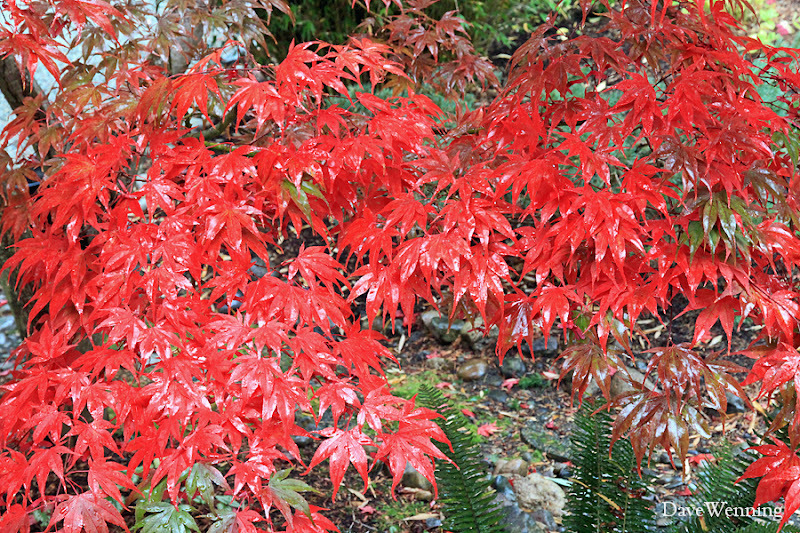 Japanese Maples are small scale trees available in many forms and leaf colors. Sizes range from 4 foot (1.2 m) dwarfs to around 20-25 feet (6-8 m). Osakazuki is one of the larger varieties. They seem to like the same growing conditions as Rhododendrons and Azaleas. Mine are thriving in the native glacial till soil which tends to be dry and packed hard in the summer. My Osakazuki grows on the north side of the house where it gets some full sun, dappled sunlight and afternoon shade. The Japanese word Ōsakazuki translates to "I love Osaka," referring to Japan's second largest city. Even after the leaves have dropped to the ground, the beauty continues. 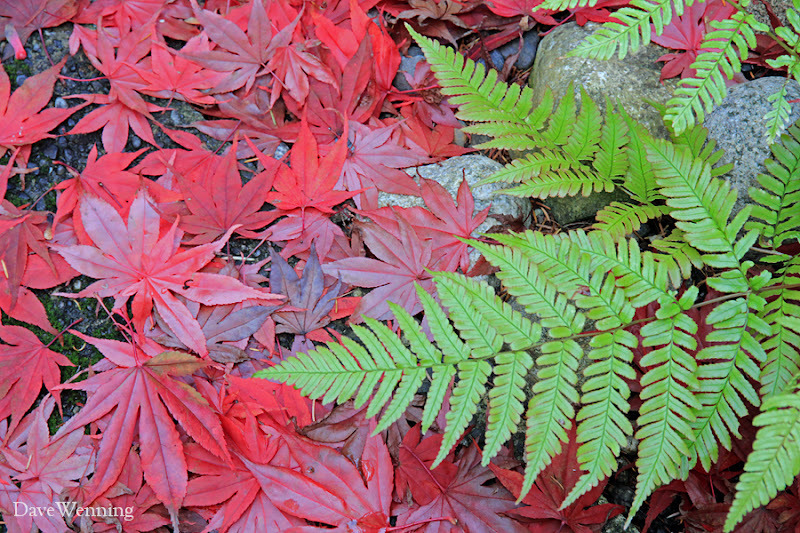 The Autumn Fern is another Japanese native, Dryopteris erythrosora. This is a fern which also displays different seasonal colors. It is a relative of our native Wood Ferns. 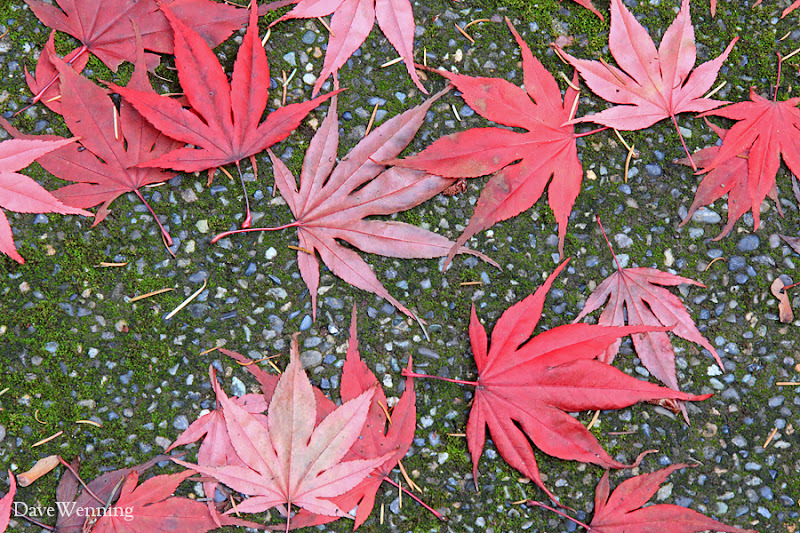 You know you are in the Pacific Northwest when walkways are decorated with Japanese Maple leaves, fir needles and moss. 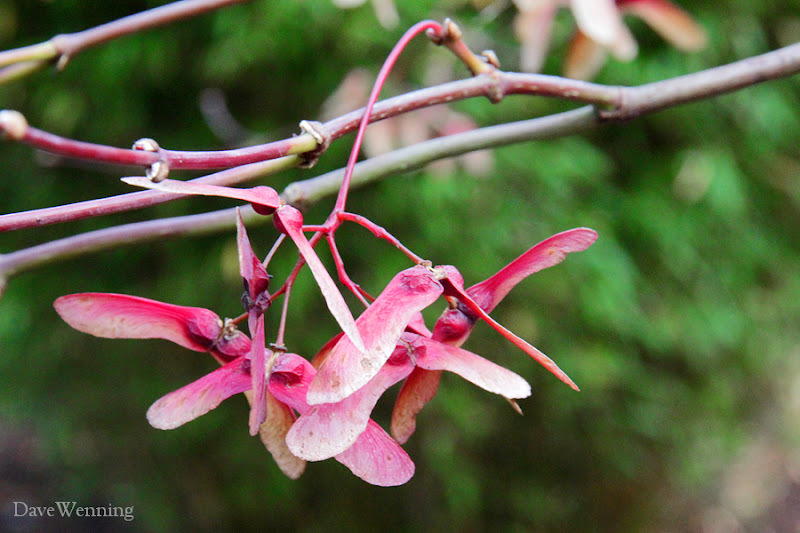 The winged fruits of maples are called samaras. Osakazuki produces them abundantly in clusters. The tree will hold them after the leaves have dropped making it look adorned with red-tinged lace. My Osakazuki Japanese Maple is more than twenty years old now. Nevertheless, the tree's brilliant display takes me by surprise every autumn. When the skies are gray with a bit of chilly drizzle, what a pleasant surprise it is. Thanks Dave for your comment on G+... I love these little maples, we have one that was in our garden when we moved into our home 25 years ago, so who knows how old it is. It partially froze a couple winters back and I thought I'd lost it, but it sent out a couple new branches, so we're still in business! 'I love Osaka,' I like that! Isn't Osaka the sister city of Seattle?? It is a plant that I would like to grow. I know people love lilacs up here, but I love all plants south of here. I think a move south to be in the cards for me. Aromatic plants and colorful too many people living in warmer climates.